354 pages | 8 B/W Illus. 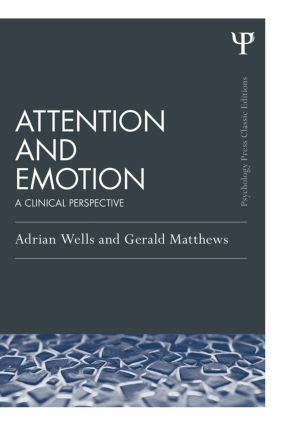 This is a Classic Edition of Adrian Wells and Gerald Matthews’ award-winning textbook on attention and emotion, which now includes new section introductions. The book won the British Psychological Society book award in 1998, and is now widely seen as a classic in the field of emotional disorders. Attention and Emotion: A Clinical Perspective critically reviews the literature on attention and emotion, and offers an integrative cognitive attentional model of the development and maintenance of emotional disorders. The authors also discuss the implications for clinical practice of attentional theories of emotional dysfunction. In the new section introductions, the authors reflect on the influence of their ground-breaking model and the subsequent developments in the field, 20 years since the book was first published. The book will continue to be essential reading for students, researchers and professionals with an interest in disorders of attention and emotion. ‘The impact of the publication of Attention and Emotion twenty years ago cannot be underestimated. It systematized accumulating empirical evidence in the emerging field of emotion-cognition interactions. It provided a structured framework to integrate these data, as well as a theoretical model to guide and stimulate research and the development of clinical applications. One of the many strong features of that work was and remains to anchor cognition-emotion research in a precise understanding of the cognitive architecture. Twenty years later most of the issues initially introduced in that ground breaking book are at the heart of current research on emotion and cognition. The original text is just as relevant as it was. The key topics of attentional bias, thinking styles, strategic processing and emotion are still at the forefront of current research. Their importance was presciently established in Attention and Emotion twenty years ago. These concepts have also had a significant impact on clinical practice, with the development of interventions now documented as being effective. The introduction to the new edition clearly synthesizes the progress that has been made since the original publication of the book. It highlights the many topics that are still relevant in current research and practice and brilliantly identifies avenues that remain to be investigated. Attention and Emotion is a must read for anybody interested in the interaction between cognition and emotion both in healthy and clinical populations.’ – Isabelle Blanchette, Université du Québec à Trois-Rivières, Canada. Adrian Wells is Professor of Clinical and Experimental Psychopathology at the University of Manchester, UK. His research interests are in the areas of cognitive theory and therapy and emotional disorders. He has made major contributions to treatments for anxiety disorders and he is the originator of Metacognitive Therapy (MCT). His treatments are included in NHS NICE guidelines. Gerald Matthews is Research Professor at the Institute for Simulation and Training, University of Central Florida, USA. His research focuses on human factors, cognitive models of personality and individual differences, and task-induced states of stress and fatigue.